Code: NB -7343 Spinnaker Ct. Incredible Views of Gulf and Sound! Enjoy beach, pool, and decks! Incredible Views of Gulf and Sound - Enjoy beach, pool, and decks! Welcome to an amazing home on Navarre Beach. Cloud Nine is positioned on the west end of Navarre Beach right near the National Seashore . This house boasts some of the most stunning views on the Island. It has two large wrap around decks that make you feel like you're in the clouds. The home was named "Cloud Nine" because it is nothing less than a heavenly paradise! Cloud Nine has 4 bedrooms and 4 bathrooms, but don't let that deceive you. It is spaced perfectly to sleep a large group comfortably. The rooms are big and the bed layouts are planned with big families and groups in mind. The first floor of the home has a large two car garage with extra space for beach chairs, toys and umbrellas. This floor also has a large entry hall where the elevator is located.The outside shower is located just off the entry so removing sand from the beach is easy. The second level of the home is where the views begin! This house is positioned to provide each room with views of the gulf or the Santa Rosa Sound. This floor is also the main sleeping quarters with three of the four bedrooms located on this level, along with three bathrooms and a laundry room. The master bedroom is very spacious with a king sized bed, a walk in closet, and a large TV. This room also has a cozy seating area with a sleeper sofa and a side chair, making it a great place for a couple with a toddler. The best feature of this bedroom is the incredible views of the gulf as well as a large private deck. The master bath has two sinks, a soaking tub, and a separate shower. This floor has another bedroom that is the equivalent of a second master. It has a king size bed, a large flat screen, a walk in closet, and an attached bathroom. This room has amazing views of the sound and the north side of the beach. The third bedroom on the second floor is a designated bunk room and is perfect for kids or teens! This room was newly designed to provide extra sleeping to help accommodate large groups. It has four custom built queen bunk beds which sleeps 8 comfortably. It also has a flat screen TV and a good sized closet. A separate bathroom for this room is located directly across the hall. The top floor of this house is the "Crown Jewel”. It would be hard to find a vacation home that could compete with the views this home provides. Cloud Nine was designed to take full advantage of its location. So, if you are cooking in the kitchen, watching TV in the living room, or eating in the dining area the views are breathtaking. This grand room is an open concept design so that traffic flows from the eating and living areas out onto the large deck with ease. In the living room you will find a tremendous sized sectional that allows seating for over 10 people and also holds a queen sized sleeper. The large flat screen is HD and is on the same grand sized scale.This large great room also has two exterior doors that lead to the wrap around deck. It is the perfect place to cook out on the gas grill or just enjoy a glass of wine and watch the sunset. The kitchen comes fully equipped with everything you need to entertain and feed your large group . It has a center island that provides extra seating for three. The dining table is a perfect scale for the room and will seat 10. This floor has the 4th bedroom with a queen bed, large closet, and sound side views. Cloud nine has an easy beach and pool access. The gulf is just right across the street where you will find wide open sand and water for miles. The pool is steps from the house and is just off the front driveway. It is a community pool that is seldom used so you never have to worry about a crowd. The location of this home is perfect because it is in a low traffic area at the end of the island. 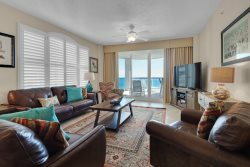 You can enjoy the family oriented style of Navarre Beach while being located as close as possible to Pensacola Beach which offers dozens of amazing restaurants and shops. This means you have the best of both worlds! Just remember, this is not a house to pass up. Our guests love the location and amenities. Book now as this is the type of property that sells out quickly for peak and even off peak dates. Please call us directly for more information or to have any questions answered regarding "Cloud Nine".